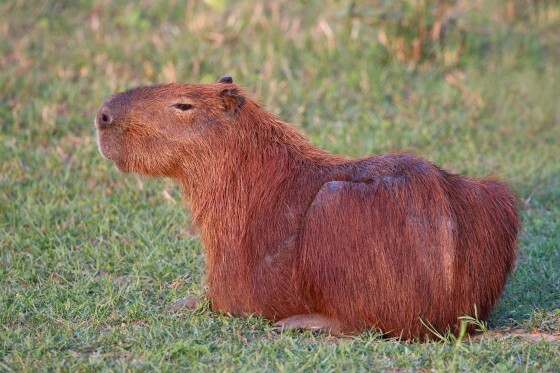 Adding to the usual golf problems of sand traps, water hazards and bad lies, Olympic Golf in Rio has added another: the giant rodent known as the capybara. A herd of some thirty to forty of the 100+ pound rodents now call the course home and a few have taken to sleeping in the bunkers. The good news is that they’re herbivores. I would much rather see these than alligators, snakes or bears. Capybara are the largest rodents in the world. A social animal, the capybara lives in groups of 10 to 100 individuals. An adult capybara can grow to four and a half feet in length, two feet tall and 150 pounds. Capybara are semi-aquatic. They have slightly webbed feet. Capybara can stay submerged for five minutes. The favored habitat for cabybara is dense forest near bodies of water and flooded savannah. Capybara are herbivores who eat grass, aquatic plants, fruit and tree bark. Capubara jaw hinges are not perpendicular, allowing them to chew their food by grinding back-and-forth. Capubara can live up to twenty years, but likely will live less than half that in the wild, since they are the favored food of many predators. Capybara are found in all of South America except Chile. Some have been spotted in Florida and California. These populations are likely the result of escaped pets.